A dozen primary school-aged children sit around desks taking instruction from their tutors, local college students who volunteer as English language teachers at the Rohingya Culture Center in Chicago. The center’s founder, Nasir Bin Zakaria, 40, watches from a distance, nodding in delight whenever a child gets an answer right. Zakaria, who works full-time as the director of the center, fought tirelessly to create this space for refugees. Opened in April on the busy and popular South Asian corridor along Devon Avenue near Rogers Park, the single-story, open space, with rooms in the back for more private gatherings, is a sanctuary where these new Chicago residents come to feel at home after escaping hardship in Myanmar. A huge map of Myanmar adorns one wall, and an elevated podium serves as a stage for notable events. White boards hang on one side of the wall, which is where children and adults alike come for lessons. The center offers new refugees support services like English lessons for children and adults as well as Quran lessons. It also hosts parties and weddings. “In Malaysia, Thailand, Singapore, we never have centers like this.” Zakaria said. “They are about freedom. This is what this center is about.” He added the greatest challenge is educating people about the plight of the Rohingya because they simply don’t know. Kevin Douds, 26, is one of the volunteers who teaches English to both children and adults at the center. A graduate student at DePaul University, Douds has a special interest in working with refugees, especially those who have suffered religious persecution. Aisha Shamsuddin, who moved to Chicago from Malaysia five years ago, works as a volunteer distributing food among Rohingya refugees in Chicago through charitable organizations like Icna Relief and Zam’s Hope. She estimates that there are 300 Rohingya families in Chicago, mostly living in the Devon area. “When I came, I was the fifth family to move to Devon,” she said, adding how the Rohingya like the neighborhood because it has mosques, halal grocers and, of course, other families like them. The Rohingya are Muslims from Myanmar, the Southeast Asian nation formerly known as Burma. They are denied full citizenship in their home country unless they can prove that their ancestry dates back to 1832 when the country came under British rule. After independence, citizenship laws recognized eight races in the country and did not include the Rohingya. The 1982 citizenship law, the most recent, classified people into three categories: full citizens, associate and naturalized, with each ethnic group falling into corresponding sections. The Rohingya, who some say surreptitiously roamed into Burma from India during colonial rule, do not qualify as any of the above as they are seen as illegal immigrants. They have long complained of persecution, but in 2012, increased efforts to expel the Rohingya sparked a surge in violence in Rakhine state, the territory located on Myanmar’s western coast, where the Rohingya predominate. The violence resulted in innumerable deaths and displacement. Myanmar is currently in the throes of rapid social and political change. In 2015, after more than 50 years of military rule, the country held its first elections in 25 years. Nobel laureate Aung San Suu Kyi, the former political prisoner who emerged from nearly 15 years of house arrest, led the National League of Democracy to victory and holds the position of foreign minister and state counselor. However, she has come under criticism for her silence on the violence against the Rohingya. In May this year, the United Nation’s High Commissioner for Refugees estimated that 1 million Rohingya were without citizenship in Rakhine and expressed concerns about the 120,000 displaced people in the country. According to a State Department report, 18,386 refugees were admitted into the U.S. from Myanmar in 2015, with the bulk of them (11,902) arriving between Oct. 15 to Sept. 15 of that year. That is only slightly more than the 11,598 Syrians who arrived in the U.S. during same period, according to the State Department. It is difficult to ascertain how many of the refugees from Myanmar are Rohingya, but the State Department’s Refugee Processing Center indicates that 6,524 Muslims arrived from Myanmar. The number likely includes Rohingya and other Muslims from Myanmar. 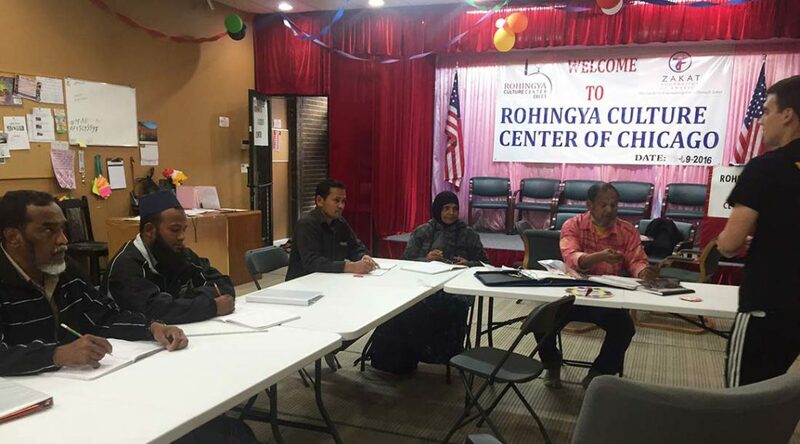 For Nasir Bin Zakaria, the development of the Rohingya Culture Center in Chicago has been an effort to provide stability in a foreign land for those fleeing the violence and bloodshed in his homeland. He identifies with their plight because he has experienced discrimination all his life. Born in Buthidoung in Rakhine, Zakaria was used to being referred to as “kallah” a pejorative word used to describe the Rohingya. At the age of 14, he was kidnapped by soldiers but managed to escape to his uncle’s home. He would receive word from his father, in a nearby village, urging him to leave for Bangladesh, as he was no longer safe in Myanmar. But his arrival in a new land brought a different set of challenges—namely language barriers and unemployment. He worked as a dishwasher at a downtown restaurant and later at Rivers Casino, where he was inspired by the union, and one particular woman he befriended who took him under her wing and let him accompany on her on home visits to meet with the casino’s employees. He learned what unions did, how they protected their workers, and it was during this time that he developed the idea of setting something up for Rohingya, a place where they could meet and be themselves. But he had no idea where to start. The same union leader introduced him to her friend from Somalia, thinking that perhaps another Muslim may have better insight. As luck would have it, she did. She introduced Zakaria to the Zakat Foundation of America, a Muslim charitable organization. He stressed to the organization that he was committed to having his own space for the sake of Rohingya children. “We have to continue our kids’ learning, who we are, where we come from, what is going on in Burma, all these reminders. Because maybe one day they can go help in the country,” he said. In 2014, the foundation agreed to pay the rent for one year on a space that became the cultural center. Zakat also provides an operational grant of $8,100 every three months. Zakaria quit his job at the casino and initially volunteered as the center’s director. It was difficult to forego a paycheck, he said, but he made the sacrifice because he desperately wanted this center. He decided with his wife that they would live off the $700 disability income they receive from the government on behalf of his adopted grandfather, as well as the $400 his wife qualified for as the man’s homecare aid. After seven months, however, he plucked up the courage to ask Zakat for assistance, and they decided to pay him a salary, thereby saving him from taking on a second job. He received his first salary last month. For 68-year-old Abdu Hameed, being at the center allows him to forget a life that has been filled with tragedy. At age 7, he was imprisoned for two months with his entire family in Rakhine state — on flimsy charges he said about his family being spies. His mother died 12 days after their release; probably due to the police beatings which Hameed remembers witnessing. His father died 40 days later, his grandmother a year after that. Another year later, his brother died, leaving him and his two sisters without any family to care for them. He escaped to the capital Yangon in 1972, knowing that his sisters could fend for themselves. But he would experience more hardship, beatings, detention in Bangkok between 1984 and 1987 and then in Malaysia, where he lived until 2014 before migrating to the U.S. as a refugee. He now lives in Chicago with his son after moving from Idaho eight months ago. Mohammed Kasim, 38, arrived in Chicago on Sept. 9 from Malaysia with his wife and four children. He has enrolled the children, who speak some English, in school and has been coming to the center every day to improve his own facility with the language. Hameed translated for Kasim as he narrated his harrowing escape from Yangon in 2000 after an encounter and beating by the police inside a mosque where he worked. He traveled to Thailand and then Malaysia where he lived for 16 years. He said he moved to the U.S. because he wanted to be counted as a citizen of a country, with proper identification papers. Chicago seems a popular choice for Rohingya refugees and it seems to be because there is a vibrant community in the windy city. Both men said they had heard Rohingya lived in Chicago so they chose to move here too. Shamsuddin too recounts how she used Google to look up Chicago and found Devon Avenue as a good place for Muslims. Despite his own hardships and the harrowing stories he hears from his compatriots, Zakaria said holds no grudges. He says he wants to look forward while still ensuring that the younger generations of Rohingya in America maintain ties to their heritage while building a life in their new homeland.